Family Tree DNA kicked off its Decennial Conference on Genetic Genealogy at the Hyatt North Houston in Houston, Texas. Max Blankenfeld welcomed the crowd of more than 180 group administrators and acknowledged those who had been to all ten conferences as well as those who have been group administrators for more than ten years. Max encouraged constructive feedback of Family Tree DNA in order to be sure the company moves in a way that works for the administrators and customers. Bennett Greenspan gave an overview of the speakers for the weekend. 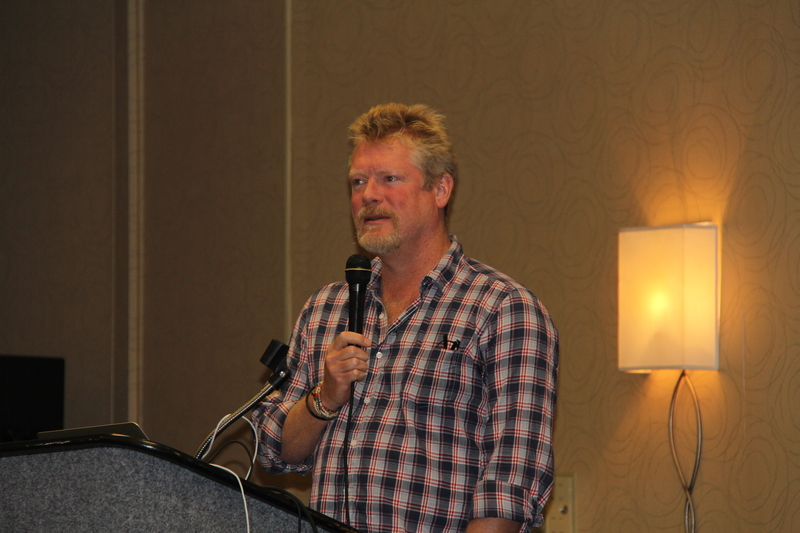 Spencer Wells presented Consumer Genomics The 30,000-Foot View. Spencer is a geneticist and anthropologist by training. Spencer shared a clip from Journey of man that focused on L. Luca Cavalli-Sforza, who made monumental steps when he discovered that our blood linked us to our ancestors. In the early 1990s Spencer worked with Luca in California to look into the past. Spencer reviewed the work of the Genographic Project, which is comprised of field research, public participation, and the Legacy Fund. We are currently in a period of cultural mass extinction. We are losing a language every two weeks through the process of cultural assimilation. Culture is the only thing we have going for ourselves. They have ~75,000 samples from more than 1,000 samples in the field research area. The Legacy Fund is up to $2.3 million. Legacy Fund grantees are 91 and counting, including projects to preserve language and dance. There is a project in South America to preserve ethnobotanical knowledge. Geno 2.0 sought to leverage the scientific insights and samples from the first phase of the project. They updated genotyping technology and scientific grants were opened to the entire genetics community. Anyone can apply. There is a new education initiative, GenoThreads. Spencer does a lot of middle and high school visits every year. Legacy grants program will continue. They did not anticipate the power of this project to harness the power of the community. 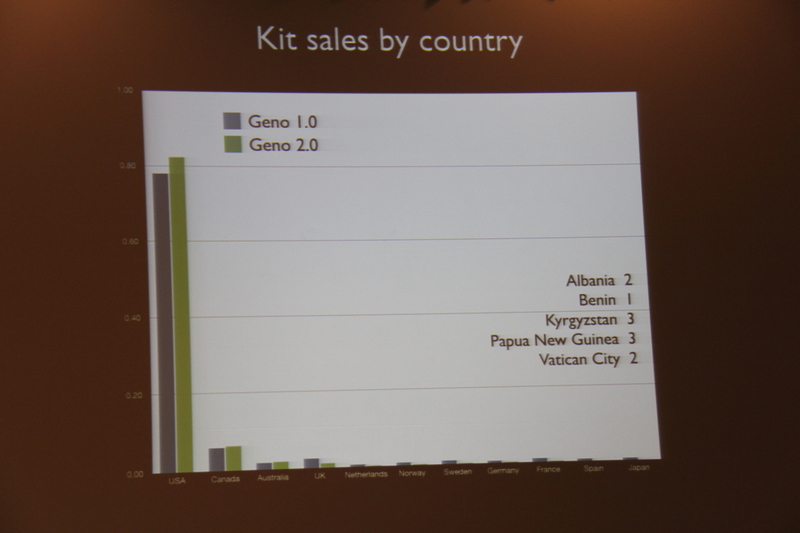 Most Geno kits are sold in the United States but they have reached 130 countries. 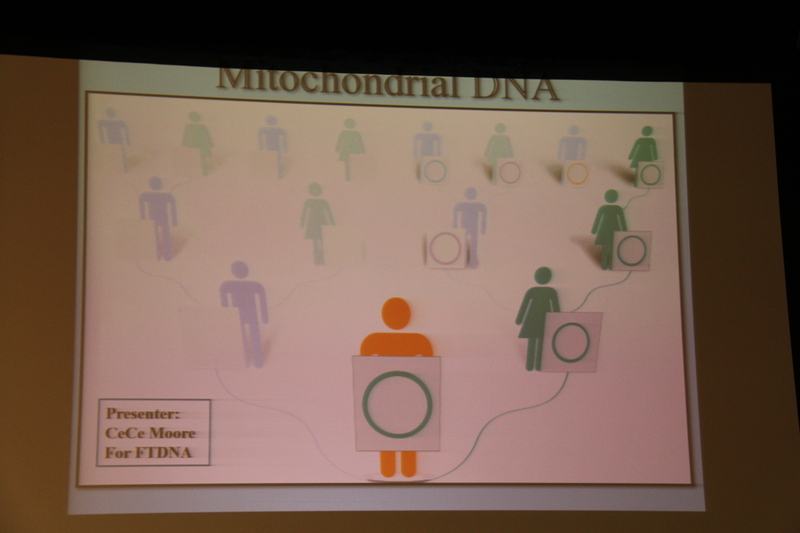 Spencer talked about the power of “citizen science.” Spencer told of a woman in Budapest who sent an email to say that her results must be wrong, as her mitochondrial DNA showed up as Northern Siberian. This caused Spencer to look further into it, which would not have happened without this woman questioning her origins. 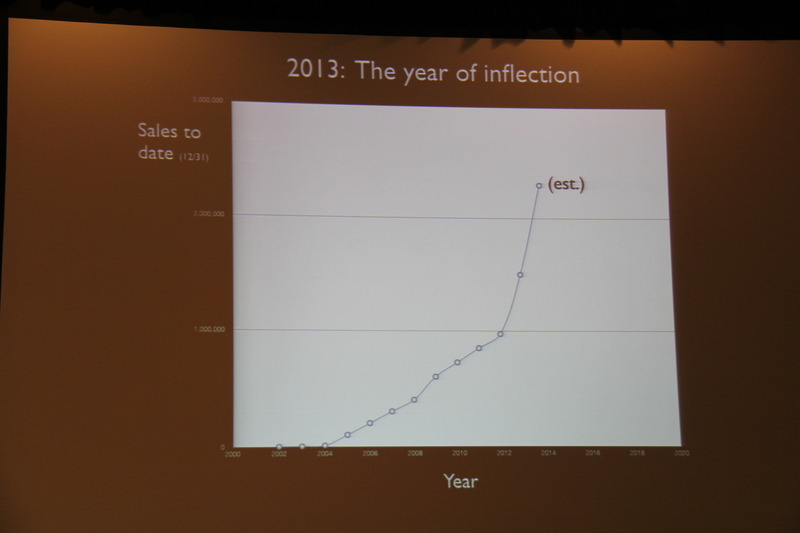 Between 2004-2013, the first million tests were ordered. This took eleven years. The second millionth kit was sold by early this summer and the third will likely be sold by early 2015. This will continue to grow exponentially. Why? DNA is now a part of the national consciousness. People are more comfortable talking about it and sharing. Most importantly, there is viral spread by word of mouth. Spencer shared his predictions for the near future. Ancestry will be the primary driver of growth because medical testing is subject to the ‘clinical utility trap.’ There is a huge international maret potential. The big four already control 99% of consumer genomics market in the United States. One of the key features people will be looking for is citizen science functionality. As we move forward, brand awareness and sales and marketing experience will matter more and more. Is it true that everyone descends from one man and one woman? A: Yes. They were not the only people around at that time but they were the only ones who were able to pass on their genetic information that remained until today. The male and the female did not live at the same time. When will DNA testing become popular in Europe? A: As Europeans learn to see it more as a genealogical tool. Most Europeans know where their ancestral villages are. Which isolated populations have you yet to visit or would you most like to test? A: Many. I would particularly like to test more in the lower 48 United States. There are a lot of cultural, political, and land rights concerns. This has been very difficult and consultants have been employed to try to help with outreach. Geno 3.0? New SNP chip? A: Yes and yes. When will we be able to search a database that the Geno project has sampled? A: You can do it now but there is an application process to be an affiliated researcher. Check the website to learn how to do that. How much research is still being done in the field? A: They are still collecting samples. Spencer is planning an expedition to Southeast Asia for next year. Do you have plans to do whole genome sequencing on samples from some of the rarer locations? A: Yes, but not soon. They are waiting for the expense to come down. Are there any more programs planned? A: Documentaries are getting harder to pitch. Any new books? A: Yes, Spencer is working on a book called The Ghost of Genghis Khan. What role would you predict for this group as consumer genetics grows? A: Spencer compared us to the Mary Kay Cosmetics model. The administrators are the biggest supporters and are critical to success. 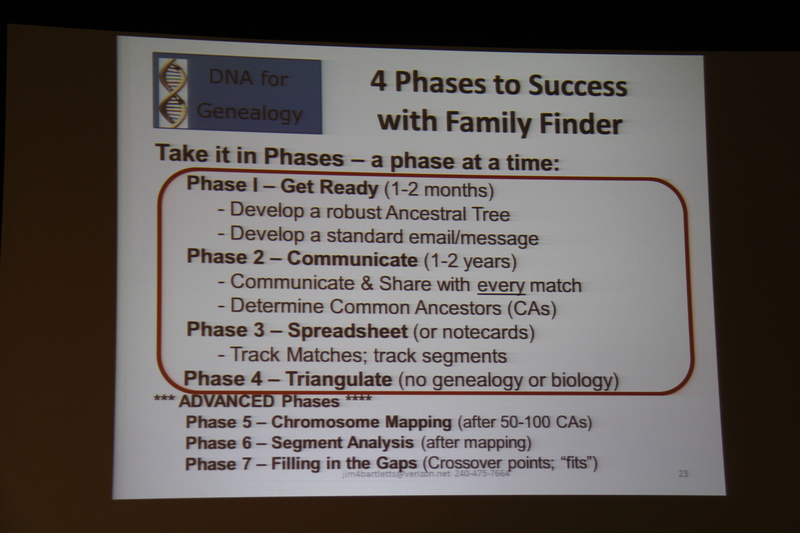 Jim Bartlett presented Family Finder [and Triangulation] for Genealogists. Jim is a proponent of triangulation. Jim reviewed some foundations. If two people have common DNA, they share an ancestor. Jim went through the process of navigating Family Finder results. Jim provided specific steps to working with the Family Finder results. First, develop a robust ancestral tree. Extend your tree as far as you can possibly go. Jim calls this a “net” to catch your cousins. Next, develop a standard email including your name, email, and a link to your tree. Jim advocates that you should email every match. Start with your closest matches and work through them. Family Tree DNA allows you to download your matches into a spreadsheet. The columns each person chooses to utilize is an individual choice. The triangulation rule is that three matches match each other on the same segment. People use different thresholds for their spreadsheets. Jim uses 7cM, which is a middle ground. Every shared DNA segment you have is either on your mom’s side, your dad’s side, or neither. When it is neither, it is IBS, or identical by state. Triangulation determines if your segments are in group A, group B, IBS, or undetermined. In a triangulated group, everyone will have the same common ancestor. This works with all companies and Gedmatch. What if there is consanguinity? A: Every segment has one common ancestral line that comes to you. If you have double or triple cousins, it still starts with one ancestor and comes down only one path. There may be several options but your DNA only came down one way. Can an IBS segment be passed on? A: There are two kinds of IBS segments. One is a compound segment from both parents not from a common ancestor. The other is a mix from both parents and is not passed on because it was never a real segment to start with. How many cMs to you recommend for X chromosome triangulation? A: Choose whatever you like, 3, 5, or 7 for the first cut. Jim still uses 7cM for the X. Is your presentation going to be available on FTDNA? A: Yes, it’s ok with me. Have you developed a technique to keep the spreadsheet up to date? A: Yes. As the matches come in, he prefers to type them in. He feels that this helps him to get to know the person and get the feel for where they fit in the spreadsheet. What’s the difference between triangulation and phasing? A: Phasing is a process where you determine mother or father side for each SNP. This spreadsheet would be 1.4 million lines long. Triangulation uses chunks. After lunch, Bennett announced a conference special of $89 on Family Finder. There was a brief power outage this morning All instruments in the lab are on battery backup from the manufacturer. FTDNA has installed a 250 kw backup generator in the building. During an outage last week, the backup power kicked in and no work was lost. Here at the hotel, the power outage seemed to have an impact on the projector bulb and good quality photos became more challenging at this point. Bennett then introduced Michael Gugel, who is in charge of Product Development. 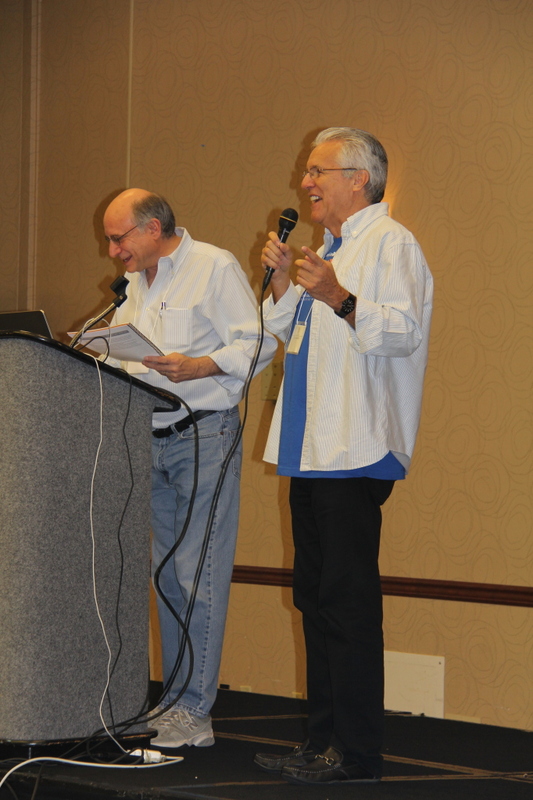 Michael introduced Razib Kahn, who is a PdD candidate and the brains behind MyOrigins. Razib presented Ancestry as a Jigsaw Puzzle. Razib said something that is the foundation of why I do what I do. When people remember their ancestors, they continue to live on. 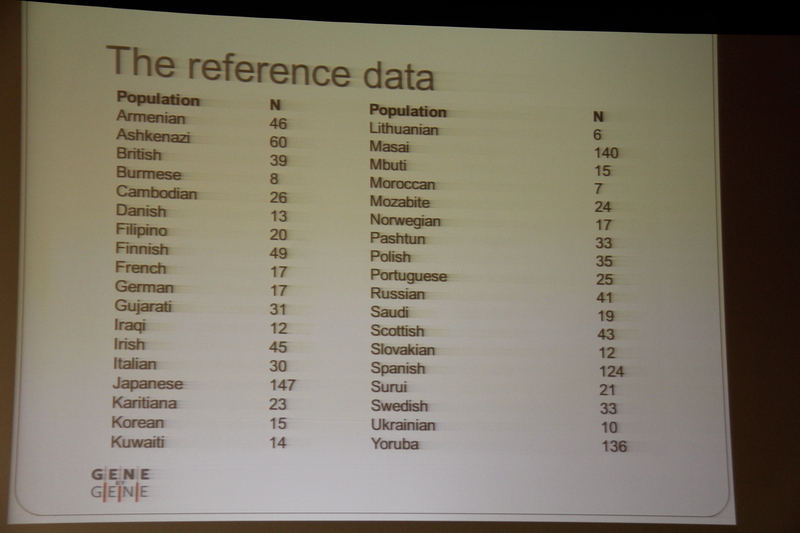 Razib showed principal components markers for a visualization of genetic distance to confirm his MyOrigins results. In his personal genealogy, the oral and paper history point to the west but genetics point to the east. Genetics is blind to human preferences and preconceptions but cultural memory often reflects our preferences and preconceptions. Razib talked about Leo Felton who was a white supremicist with an African American father. myOrigins uses model based clustering. Take the data (e.g. genetic variation) and take a model (e.g. Hardy-Weinberg) and plug in the values to produce plots. The challenge is to fit data to models. Razib talked about PCA vs. model based clustering. inferences are an algebra of reference populations. If an individual does not match any of the reference populations well, the computer makes a substitution. The relatedness of clusters should be considered. In the future can we expect somethig as detailed as the People of the British Isles study? A: Yes, if we have a large enough dataset. Will there be updates in the myOrigins results? A: Yes. How many people are needed for a reference sample? A: It depends on how distinct they are. Can we have admixture painintg for each chromosome with position markers? A: Yes. What is the approximate timing? A: 1,000-10,000 depending on cluster. Are the reference populations from Genographic? A: No, they do not overlap enough. Brad Larkin gave an update on the Surname DNA Journal. 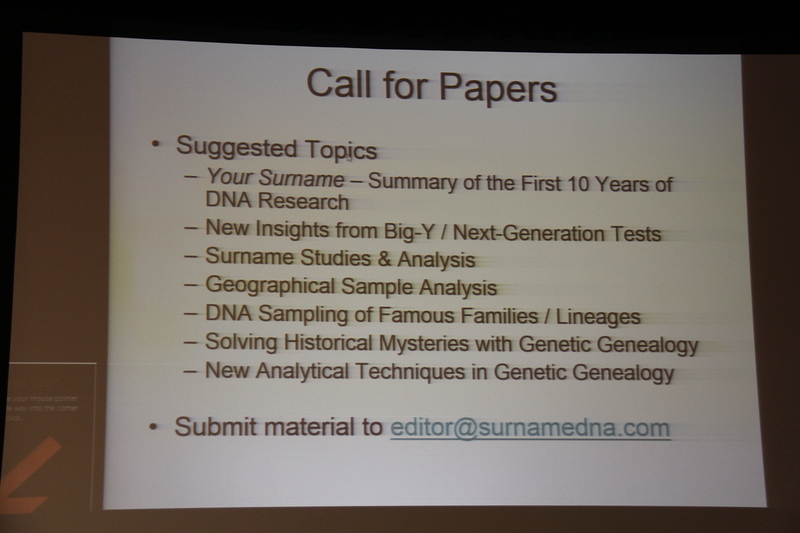 The Surname DNA Journal was conceived at the FTDNA 2012 conference. In 2014 they finalized ISSN and CrossRef DOI numbers. Brad talked about the peer review process. They are looking for articles on autosomal, mitochondrial, and Y-DNA. Reviews are made anonymously and the author has a chance to make changes before publication. This makes the papers better for the author and for the readers. Submit papers to editor@surnamedna.com. 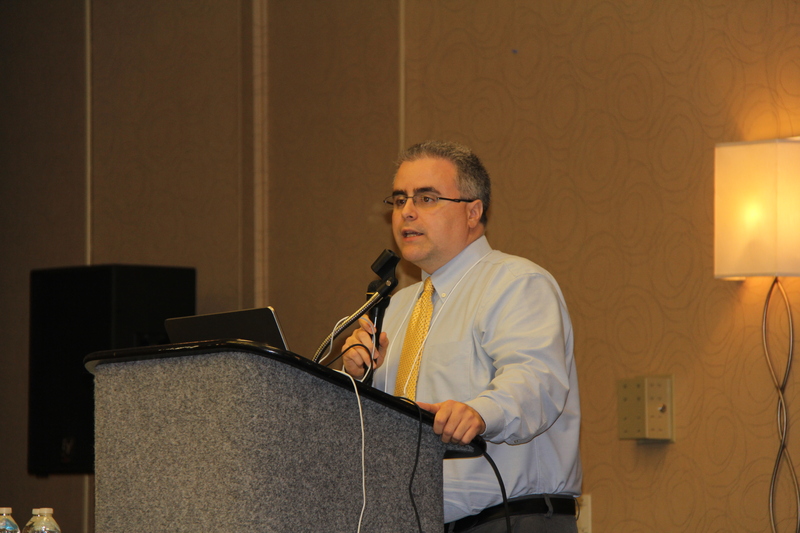 Brad presented two awards for the Genetic Genealogist of the Year. The first went to Ian Kennedy from Australia. The second went to CeCe Moore, Your Genetic Genealogist. Bennett Greenspan told us about a problem that Doran Behar had last year. He will not be in the United States. CeCe Moore spoke on DNA. She has found that mitochondrial DNA has been useful in her adoptee work. She uses this to rule in or out and help narrow down choices. She suggests the full mitochondrial sequence because with just HVR1, there is a 50% chance of sharing an ancestor in the last 52 generations but for a full sequence, there is a 50% chance that the match is within the last five generations. CeCe shared some genealogical success stories. CeCe suggested to use Ian Logan’s site as well as James Lick’s mthap Tool at http://dna.jameslick.com/mthap. Would Henry Louis Gates Jr. come to this conference if you asked him? A: He would come if Bennett asked him. What is a heteroplasmy? A: See the learning center. Mitochondrial DNA is going through a change. FTDNA tells you when you have a heteroplasmy. 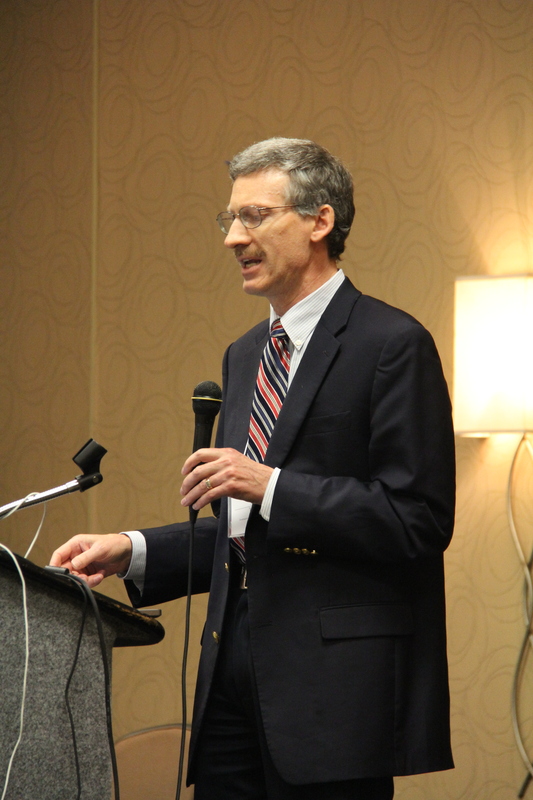 After a short break, Dr. Tim Janzen presented Discovering and Verifying your Ancestry using Family Finder. Tim pointed out that autosomal DNA may be used to determine the relatie degree to which two people are realted to each other on any line of descent if they share at least one common ancestor in the recent past. He cited statistics on how much DNA is shared between relatives, on average, and the odds of matching someone via Family Finder.Around 95,000 people have done Family Finder or have imported their data into the database up to this point. Tim reviewed basic match criteria and made mention of the option to choose match thresholds in the chromosome browser. In addition to the methods shared by Jim Bartlett, Tim also likes to test at least one child or parent and sort that as the second criteria. Tim stressed the importance of testing cousins and verifying known genealogical relationships. If you have endogamous populations in your family tree, be sure to keep refreshing your spreadsheet and be aware of the effect on results. For example, Polynesian cousins separated by 500 years can actually appear as first cousins. What does it mean by partially phased? A: This is the term when using phased data compared against unphased data. Is Scotch-Irish endogamous? A: Not highly but somewhat. What is the difference between Build 36 and Build 37 data? A: Not very much difference. They keep plugging holes in the reference data. Bennett said that he hopes that in about three weeks there will be some ability to find a block on a segment. He also said that he wants to move genetic genealogy from a survey to a census. I couldn’t agree more! Bennett spoke about an interview with the author of The Invisible History of the Human Race. The author accurately wrote what he told her and he purchased the book for all conference attendees. 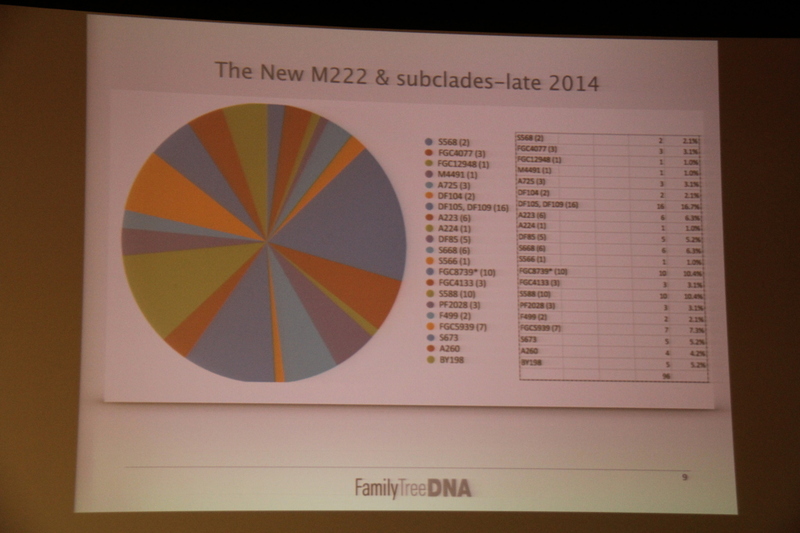 Next he spoke about the Evolution of M222. For the past decade, we have predicted haplogroups based on single tandem repeats. With 1000s of new SNPs on Geno 2.0, Big Y, FGC, and Chromo 2, there are lots of new terminal SNPs. Bennett asked Elliott if it is currently possible to predict haplogroups at a deep level with just STRs and Elliott said that it’s not do-able any more, even with 111 markers, at least for M222. People need Deep Clade testing. Family Tree DNA will be building large SNP panels, consisting of 50-60 SNPs, at a reasonable price of about $2.00 per SNP. They hope to focus more on National Geographic and Big Y SNPs but they won’t leave any out. They will be partnering with admins to create the SNP panels. Haplogroup adminstrators will be able to send in a request and it is on a first come, first served basis. Haplogroup administrators will receive an email, probably next week. Is it significant when you have several small segments on the same chrosome? A: No, perhaps it could be because of endogamy. You must map each segment. When will the M222 panel be available? A: Assume sometime next week. How do you volunteer to have your DNA used for testing? A: Send an email. How many SNPs found in Big Y occurred within the past 400 years? A: There is a paper coming out on Haplogroup G very soon that will discuss this. When you upload a Gedcom, will it keep siblings or just ancestors? A: It will include all siblings. That needs to be done given future implementations. Can FTDNA do a test on a 2005 sample? A: For Sanger, almost always yes. For Next Gen Sequencing, only sometimes. It is substantially worse with pre-2012 samples. Can I transfer Geno 2.0 to FTDNA? A: Yes, SNPs from Geno 2.0 will now appear on SNPs & Haplogroup page. Is there an incentive to order through a project? A: Yes, a $20 difference. Will FTDNA include private Y SNPs on the Deep Clade panels? A: The goal for now is only haplogroup defining SNPs to help most people. Private means that only you or your immediate family have the SNP. A determination can be made over time. Will Deep Clade panels use Sanger sequencing or chip technology? A: No. After 10 months of looking, they have found a technology and done benchmark tests. Can some SNPs occur in two different haplogroups? Yes! They can be 100,000s years apart. CeCe mentioned that there could be a problem of missing Sephardic Jew in the myOrigins database. What happens? A: It comes back as Middle Eastern. Next week, Razib will work with a new dataset that contains that population. Jennifer, Thank you for taking the time and trouble to write such a wonderfully detailed summary of the first day of the conference. It’s almost as good as being there! I don’t believe that Sephardi Jew will come back as Middle East. My paternal Uncle Roy Sinclair (352783)is a quarter German Jewish by descent. He shows 6% Ashkenazi and zero Middle-East. I believe the rest of his Jewish inheritance (the majority) is Sephardic, based on my analysis of his,mine,and my mother’s Family Finder results and the degree of endogamy they show, although this is complicated by an unrecognized by FTDNA Gypsy component in both my parents which has become obvious from discussions with matches. (And thanks, this has been very useful). My mother shows 2% Middle East and I show 3%. Thank you Jennifer for so much detail. As Debbie rightly said it’s almost as good as being there. Thanks for posting this summary, Jennifer. Excellent summary. Thank you for posting it. Superb summary, Jennifer. I’m working my way through the summaries of the talks. I’ll likely never be able to attend, and my brain is stretched with the learning – so very exciting! Thanks so much for sharing. thank you for your posts – i could not attend and they have been very informative! Thank you for posting this excellent summary. Thanks very much for posting this, especially some of the Qs & As.